Trail Condition: Trails are now closed for the season. The Northeast Trail System, known as the Pembina Gorge Trail, is located in the northeast corner of the state. The Gorge itself is a must see natural phenomenon. This system ties into the Canadian trail at three major points and it also ties into two major Minnesota trails. 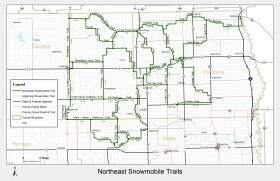 This trail offers miles of riding and usually has very good snow.